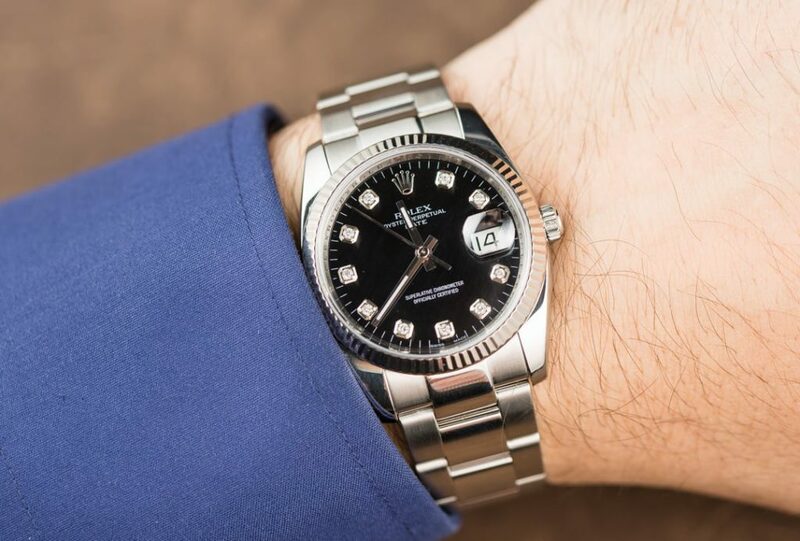 Understanding that many of their fans appreciate the best, Rolex makes diamond dials for many of their collections, including the Day-Date President, the Datejust, the Oyster Perpetual Date, the Submariner, and others. A diamond may be a woman’s best friend, but that doesn’t mean men can’t enjoy them too. Here are four Rolex watches that sport understated diamond dials for both men and women. A smaller alternative than the Rolex Datejust, the unisex Rolex Oyster Perpetual Date ref. 115234 sports a restrained 34mm Oyster case. The Rolesor ref. 115234 is part of the current collection of Oyster Perpetual Date offered by Rolex. Its elegant black dial is dotted with ten diamond markers while its stainless steel case is topped with an 18k white gold fluted bezel. The date window at 3 o’clock is magnified by the Cyclops lens attached to the scratchproof sapphire crystal for better legibility. Presented on a stainless steel Oyster bracelet, the Rolex Oyster Perpetual Date ref. 115234 flawlessly combines steel, white gold, and diamonds for an understated, yet luxurious timepiece. The Rolex President is already the brand’s most prestigious dress watch, but a dash of diamonds brings it to a whole new level. The Rolex Day-Date President ref. 118208 is constructed in 18k yellow gold from its 36mm Oyster case to its curvy three-link President bracelet. 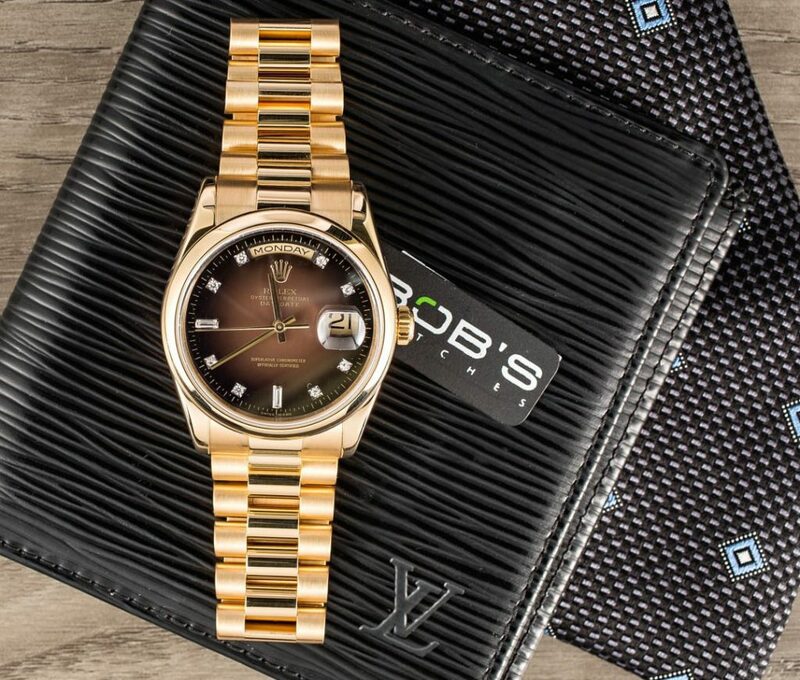 The dial of this particular President is superbly distinct with its brown vignette dial studded with ten diamonds — including two baguettes at 6 and 9 o’clock. The absence of diamonds at 12 and 3 o’clock makes way for the day and date windows characteristic of to the Rolex Day-Date collection. 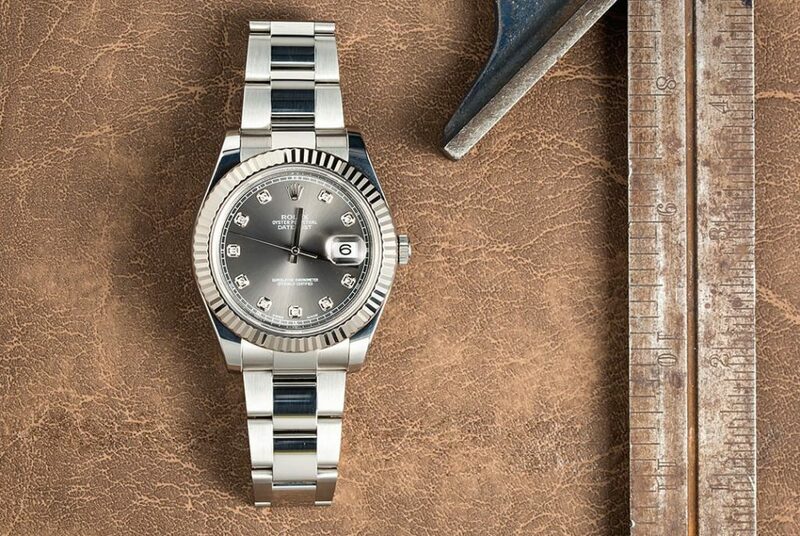 A decidedly masculine Rolex dress watch, the Datejust II models boast a 41mm sized Oyster case — significantly larger than the traditional 36mm size. 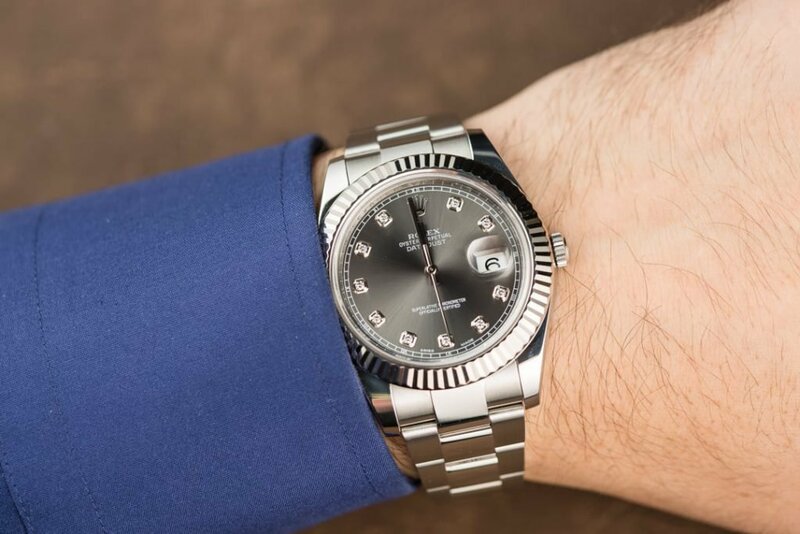 This particular Rolex Datejust II ref. 116334 is sleek and sophisticated thanks to its stainless steel construction, 18k white gold fluted bezel, and dark rhodium dial. The ten diamond hour markers framed in white gold surrounds adds a subtle touch of richness while still maintaining the watch’s robust appeal. In the early 1980s, Rolex began furnishing some GMT-Master II and Submariner models with diamond dials, which were eventually known as the Serti dial. Characterized by the combination of eight round diamond and three sapphire indexes, the Serti dial lends a very unique look to the Rolex diver’s watch. This particular Rolex Submariner ref. 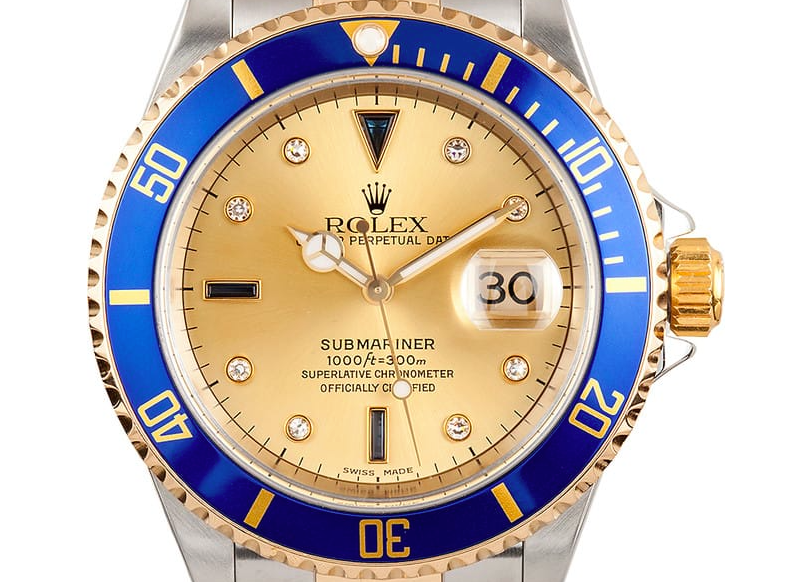 16613 features a champagne dial, blue bezel, and stainless steel and yellow gold Rolesor construction. No longer manufactured by the brand, the discontinued Submariner Serti is a very special version of the famous Rolex tool watch that always gets a second glance.